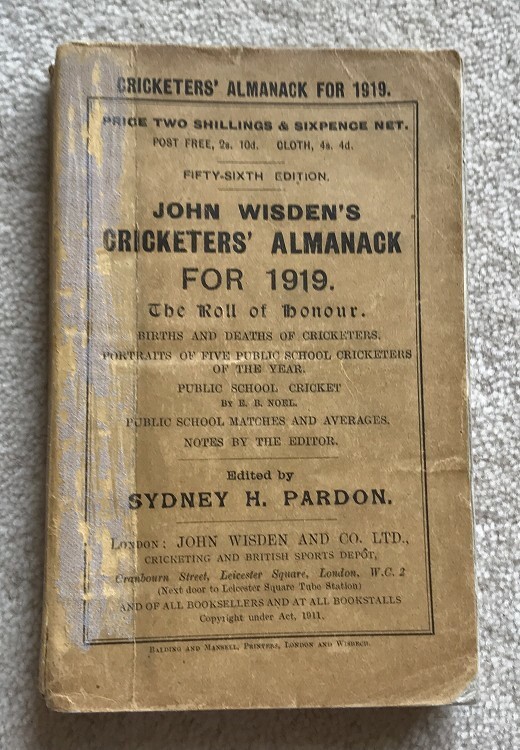 This lot is a 1919 Original Paperback Wisden. It is in Good+ Condition. The main thing to bring to your attention is that a previous owner put some larger tape to the spine, the binding seemed ok so I removed it and the spine paper was intact underneath, it has however left some residue around the spine. The spine paper is unhurt apart from the residue so no idea why the tape was added. (Perhaps as the others had it on too). The residue can be scrapped off but the cover is lighter where the tape was. Other than that it is a decent book, tightly bound and clean pages inside with a nice photoplate. I find 1919 the hardest WW1 Wisden to find.